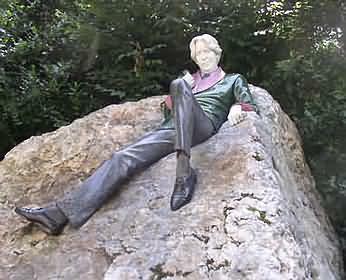 This colorful statue of Oscar Wilde (1854-1900) the Victorian dramatist & Irish playright reposing on a rock, is located in a corner of Merrion Square Dublin, close to Ireland's National Art Gallery & Government Buildings. Original Dublin images © copyright Irelandposters, All rights reserved. 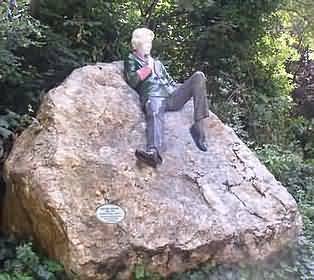 Dublin city images - life-size sculpture of James Joyce famous Irish author. Photographs of famous city landmarks & historic buildings in Dublin Ireland, with location details. Ireland posters & Irish photo gallery - main contents.